Have an Xbox? Have Kinect? Have a computer w/ MikuMikuDance? Then you’re all set to start moving and have Miku follow your lead! Read on to see what has recently developed in the MMD world. Higuchi Yū (user higuchuu on YouTube) posted a test video showing off the latest development in his program, which allows users to use Xbox’s Kinect add-on to capture their movements and have it interpreted as Motion Data for the MMD model. Using his new driver, Higuchi posted the following video showing his first test on December 13th, which only followed the upper body’s movements. On December 19th he uploaded his second test video, which showed off the full-body motion capture and announced the full download of the new driver on his website. Also, in November the Japanese section of the graphics processor maker Nvidia announced that MMD had the new ability to support Nvidia’s 3D Vision setups for stereoscopic 3D videos. A video made by Higuchi himself was posted demonstrating the 3D ability; please note that Higuchi’s video uses the setup for the red/blue glasses, while Nvidia’s default setup uses liquid-crystal shutter glasses. You can grab MMD for download over the the English MMD site. If you plan to use the Kinect setup, then you need to download the DirectX9 Ver. driver. And of course you can pick up an Xbox and the Kinect add-on at your local game, media, or online store. 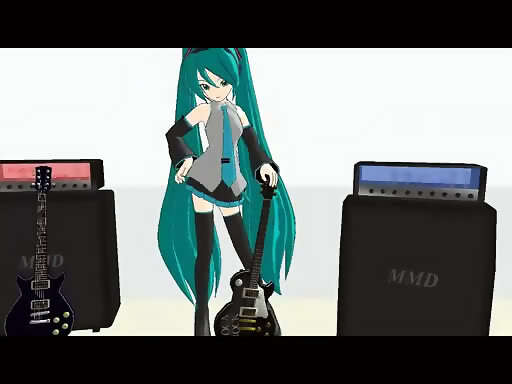 YouTube user “Nao790” showcases the use of the Kinect Sensor to control a 3D model of virtual idol Hatsune Miku. ( Microsoft sells the Kinect as a “controller-free” device for the Xbox 360 game console, but independent programmers have developed software that lets personal computers connect to the Kinect Sensor, too.) “Nao790” then uses the Vuzix iWear VR920, a head-mounted display, to see a virtual world through Miku’s own eyes. Sources: Hatsune MikuMiku, Anime News Network article one and two, NVIDIAJapan’s Twitter account.